For the next in our series, the Asylum and Beyond, Julia Nurse explores our asylum archives to find some of the earliest examples of art therapy – and some fascinating artworks! As the first asylum to actively encourage and collect practical art as a form of therapy, the collection of patient artwork at Crichton Royal Hospital is significant. Under physician Dr William Browne, who was resident superintendent from 1839 to 1857, patients were encouraged to occupy themselves in a variety of ways, including painting and drawing. 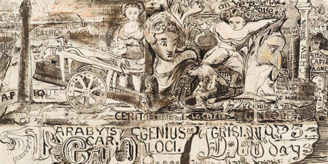 During his time at Crichton, Browne amassed a collection of 134 works by his patients, which are held at Dumfries and Galloway Council Archives and catalogued by Maureen Park in 2010. 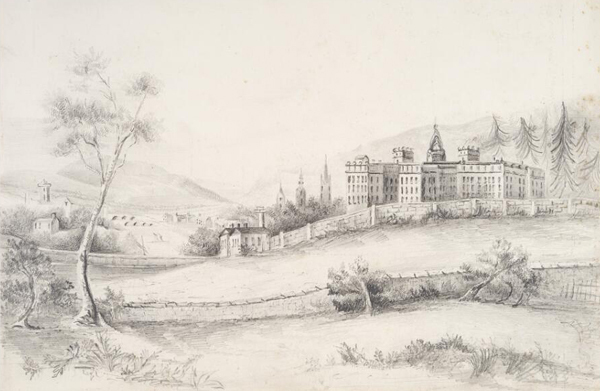 Sketch of Crichton Royal Institution in The Saturday Magazine in 1839 at the opening of Crichton Royal Institution. Original held at Dumfries and Galloway Archives and Local Studies. His moral approach to treating asylum patients reflected a growing trend away from the practical ‘mechanical restraint’ towards more humane methods that allowed patients more freedom. Based on his belief in kindness and occupation as a form of healing, Browne modified the building to allow for the many therapeutic activities on offer. The asylum was a whirlwind of activity offering work programmes, educational events, concerts, theatre performances as well as an onsite museum and library and patient run periodical. Professional art tuition was made available by 1843 and patients were allowed out to visit art exhibitions in Dumfries and beyond. It is no surprise that Crichton’s collection is wide-ranging. One unnamed patient imagined Browne’s house as a parable on an island. Though many of the makers of the artworks are identified by their ‘disorder’ – unknown “dipsomaniac” or “fatuity“, for example, some patients are named. William Bannerman favoured Scottish landscapes and William Bartholomew was a professional engraver. Richard Charteris, a patient at Crichton from 1842 to 1846, designed a play-bill for ‘Monsieur Tonson’, a farce performed at the Crichton Royal Institution theatre. 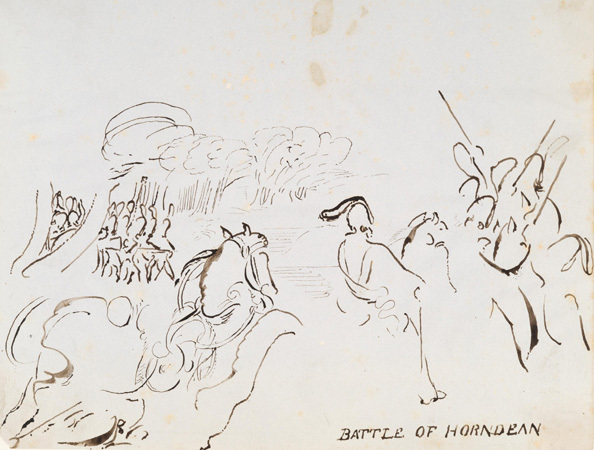 David Cathcart was particularly prolific, suffering from ‘furious mania’ he appears to have created thousands of accomplished pen and ink sketches, mostly fictitious battle sketches, during his years of confinement. The Battle of Horndean by David Cathcart. Library reference: DGH1/7/3/1/32. Original held at Dumfries and Galloway Archives and Local Studies. For some patients, Crichton provided a place of solace after numerous attempts for treatment elsewhere. 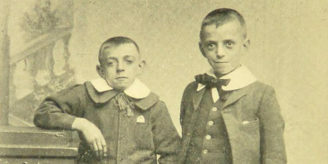 John Gilmour was said to have “suffered from delusions of persecution” and had received treatment at various hospitals in the USA and at Glasgow Royal (‘Gartnavel’) to no avail. He improved during his time at Crichton however, and he was eventually discharged. 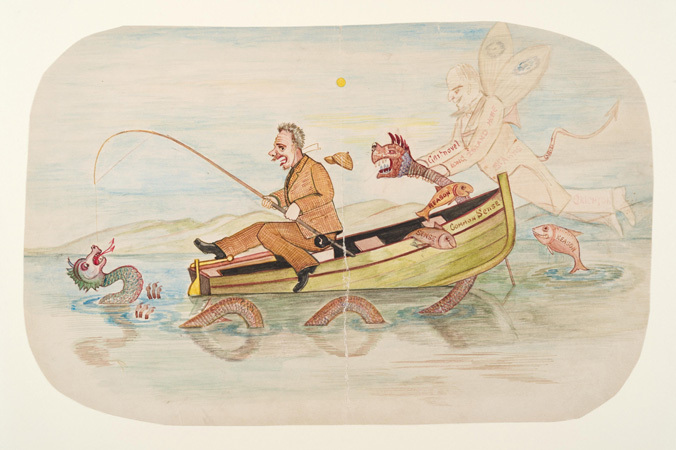 He produced some exceptional drawings during his stay including ‘The Boat of Commonsense’. Boat of Commonsense by John Gilmour. Library reference: DGH1/7/3/2/2. Original held at Dumfries and Galloway Archives and Local Studies. The roots of art therapy as we know it today lie in the moral movement demonstrated at Crichton. This movement, Susan Hogan argues, “arose out of utilitarian philosophy” and “a non-conformist religious tradition”. Yet the term ‘art therapy’ was not coined until 1942 by the British artist, Adrian Hill according to Hogan. While convalescing from tuberculosis, Hill discovered for himself the therapeutic benefits of painting and drawing. His art therapy work is documented in the 1945 book Art Versus Illness. The value of art therapy, he claimed, lay in “completely engrossing the mind (as well as the fingers)…releasing the creative energy of the frequently inhibited patient”, which enabled the patient to “build up a strong defence against his misfortunes”. A Donkey, a house a tree etc. Sketch on toilet paper by J. J. Beegan, 1946. Wellcome Library reference: 2846853i. Courtesy of the Adamson Collection Trust. Art therapy was extended to long-term patients in mental health hospitals in post-war UK by artist, Edward Adamson, whose collection of patient works on paper is held at the Wellcome Library. While locked on a ward at Netherne Hospital in the mid 1940s, J. J. Beegan used charred matches and institutional toilet paper to create his artworks – two of his drawings appear in the ‘Bedlam: the asylum and beyond’ exhibition at Wellcome Collection. Complementing the Adamson Collection within the Wellcome Library is the art collected by of Rita Simon, another early proponent of art therapy in Britain, though these works are still being catalogued.